Amazingly, we're almost done. It's hard to imagine. 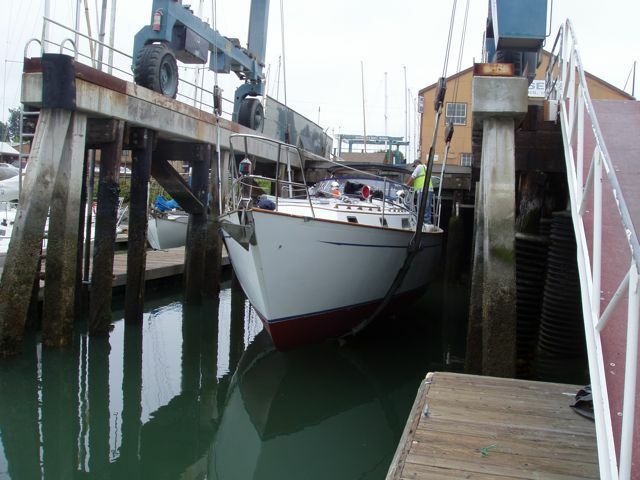 Wings is in the water, she has a mast, and nothing leaks. Why should I pull the cart? 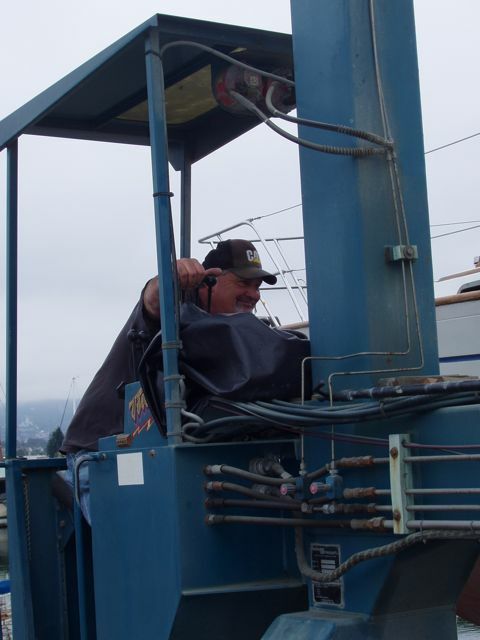 I sit on the rigging in the truck and Conni pulls me around from the boat to the mast yard. Off the cradle and in the slings. 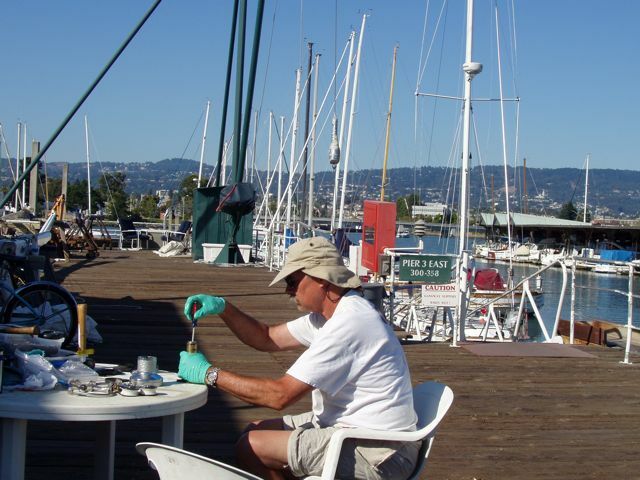 We were able to paint the hull that has been covered by the four support pads, as well as the bottom of the keel. Expensive and lovely rigging. 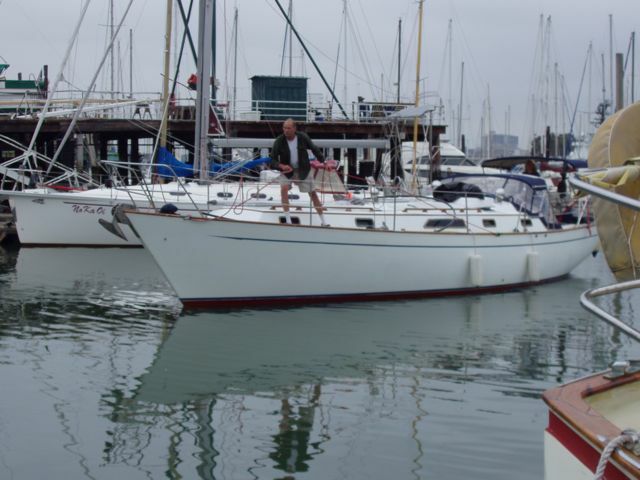 All new for 2011, it supports the mast and fulfills the insurance requirements. 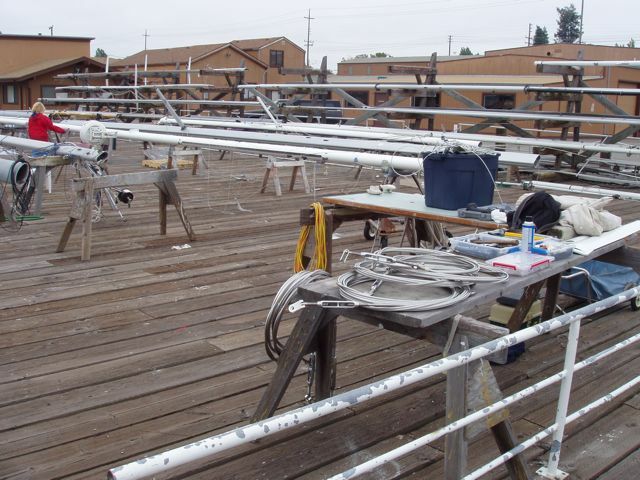 Our "station" in the mast yard. Conni is working at left. 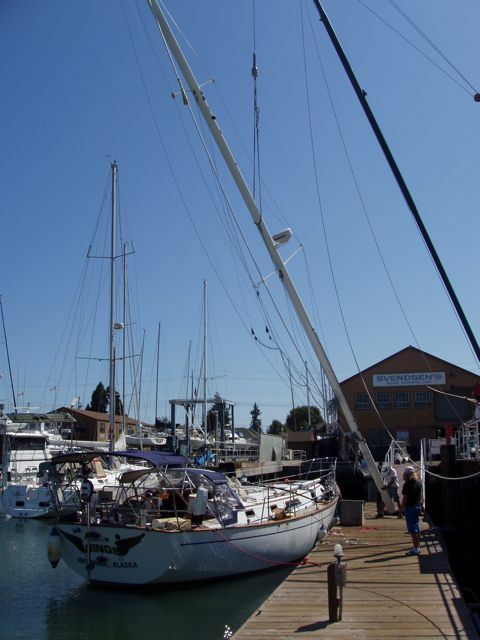 We carry the stuff back and forth from the boat to the mast yard each morning and evening. LaVerne, in the cowboy hat, and Conni, sitting to his left, work at the masthead. Lauch time! 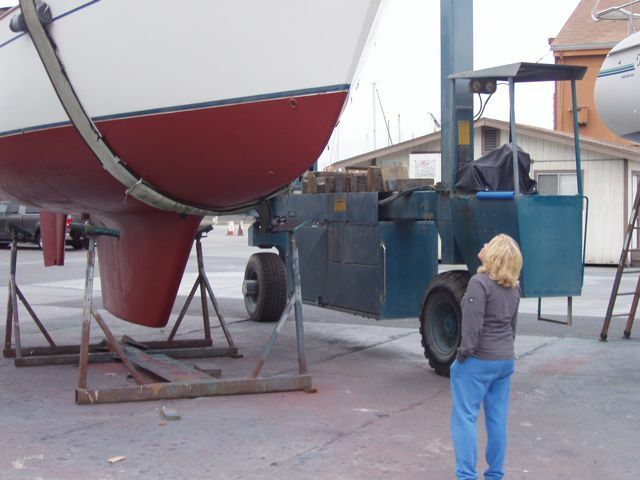 Conni inspects the hull and the paint job. 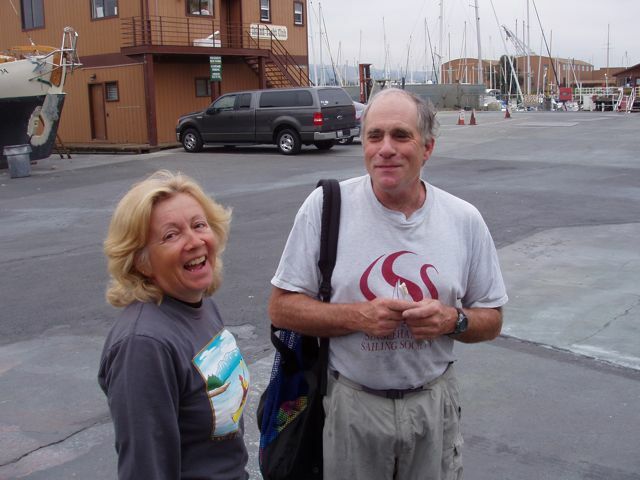 Conni and Michael, a boat yard friend who loaned a LOT of high quality tools and high quality advice. He does a lot of singlehanding. 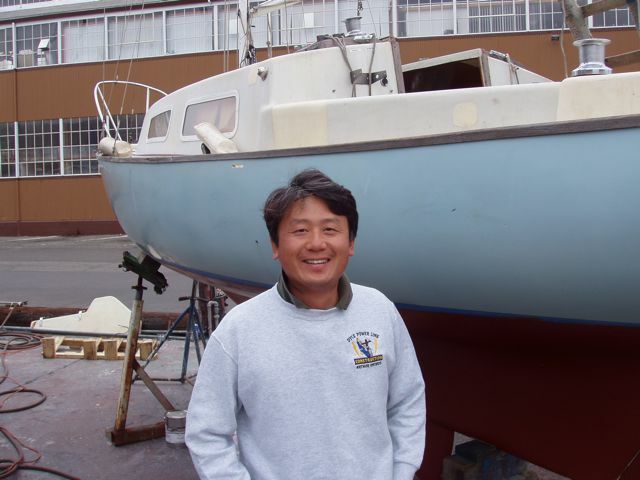 Our Korean friend, KJ, who owns his first sailboat. He's a friendly, interesting guy. 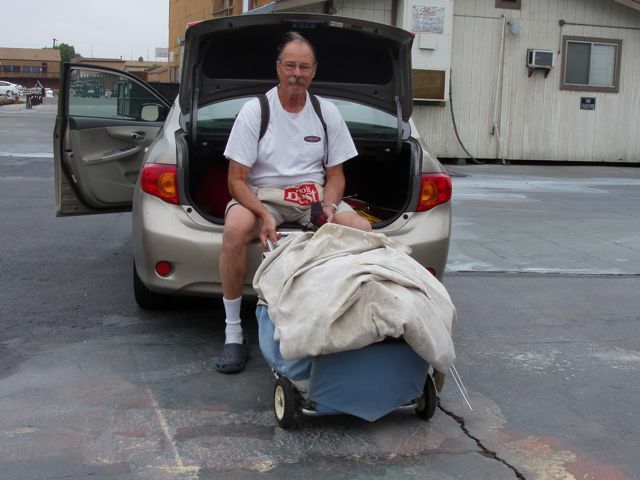 Tim operates the TraveLift. He taught us a lot and gave us pads to help reduce future lift problems. 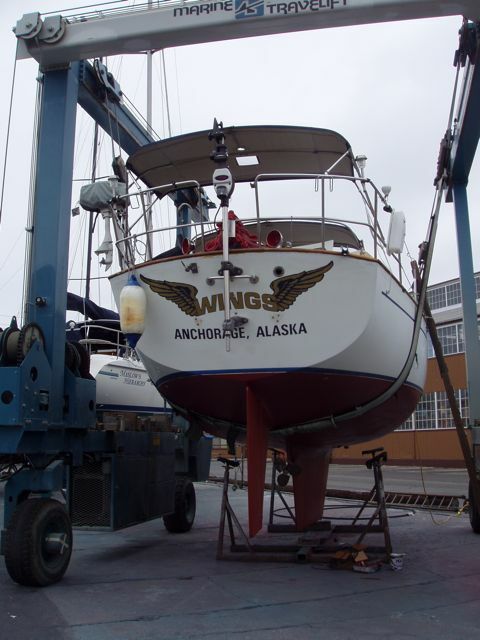 We moved Wings from the TraveLift area to a temporary dock while we awaited the mast stepping. Conni is at the helm and Bill is mis-managing the lines. Even with Conni's excellent piloting, she could not overcome faulty steering. We had forgotten to re-attach the steering! The newly-structured masthead. Conni walkes to do work. 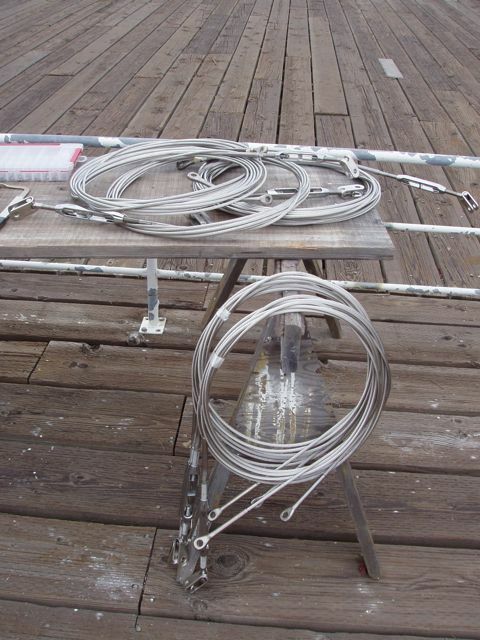 The white objects on the mashead are "cable glands" and provide strain relief for the wires and also makes waterproof the holes for the wires. 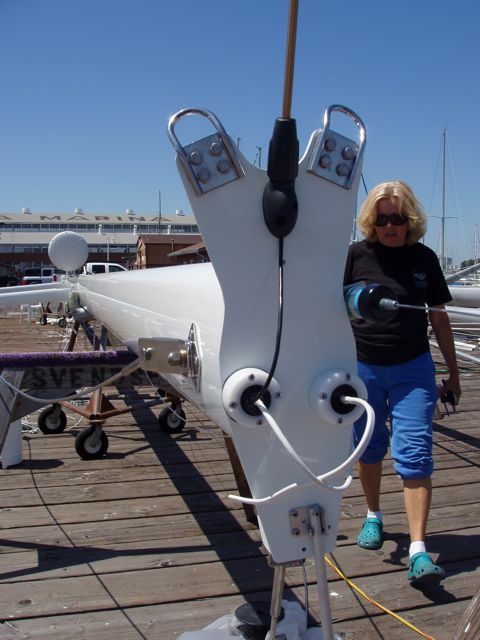 Chuck guides the newly painted mast into place as Conni supervises. 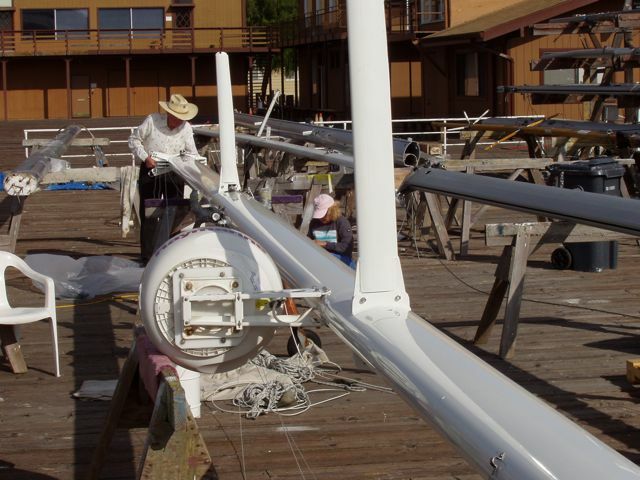 A great view of how masts are stepped. 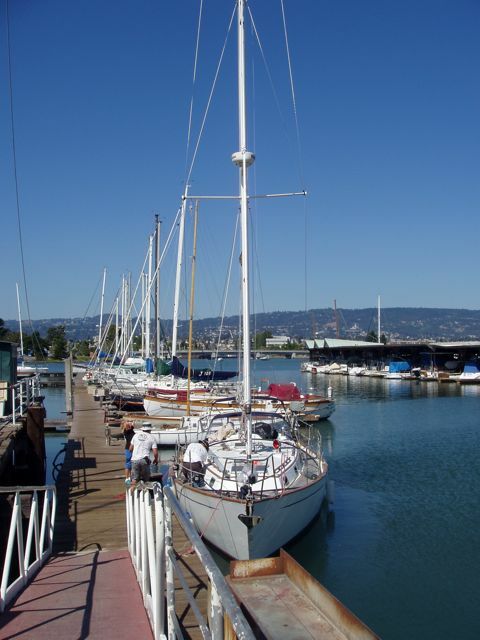 Lifting a 67-ft mast and gently lowering it into a sailboat is delicate work. 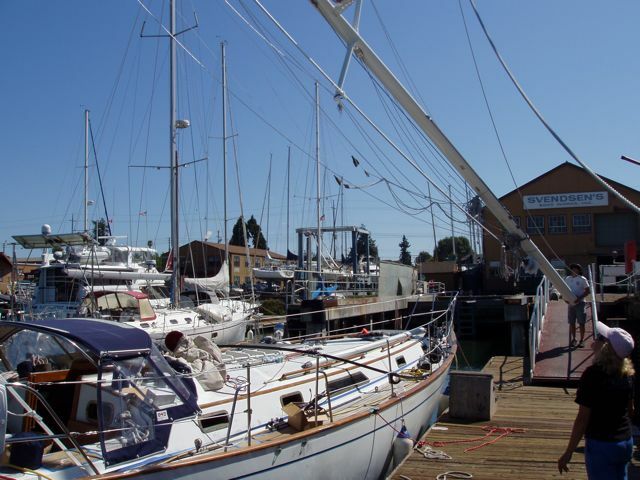 With care, you can see almost the entire through-hull, before the mast is stepped. 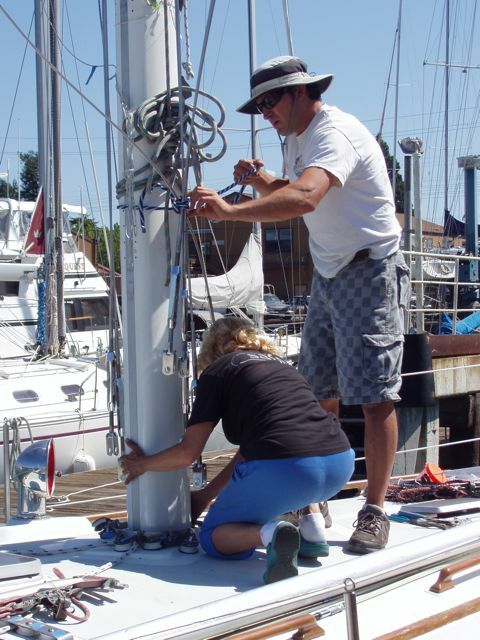 Kalin and Conni work on lowering the mast into place. We placed the traditional lucky coin on the mast step. 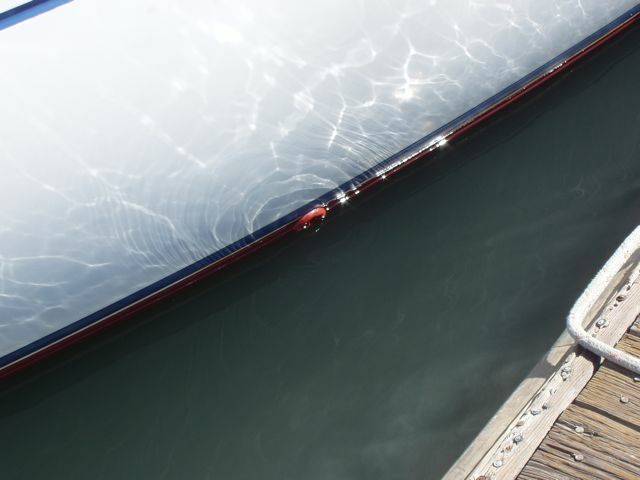 After: most of the through-hull is submerged now. 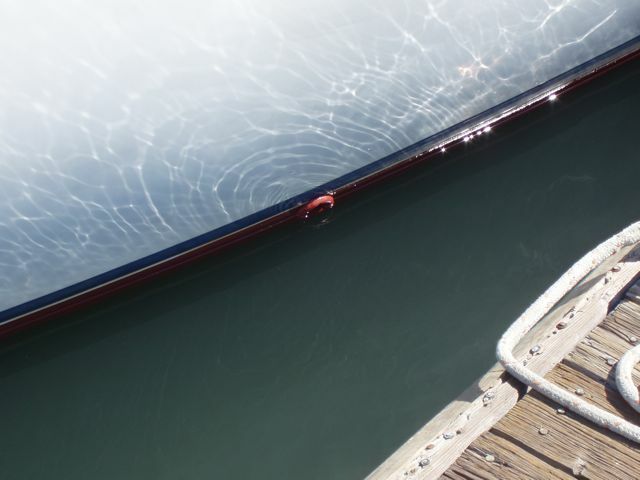 At 1700 pounds, it adds a lot to the boat's weight. Bill cleans a winch for the boom. He's decided to wear gloves since he's cleaning the winch with gasoline and diesel. Wings lies behind.